Y’all I’ve been working on this post for SO long because I wanted to get it right! It’s typically one of the most popular posts of the year, and I’m really proud of this one. Here’s my curated Gift Guide for Her (aka me and you)! It’s my own personal wish list and then a list of all of the very best gifts that I’ve ever received and still use daily! 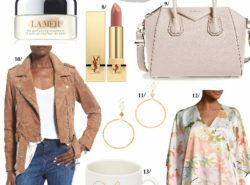 Use this as your go to guide when anyone asks what YOU might want (aka send this to your husband and/or parents and let them take the reigns) or as a guide if you feel like treating YOURSELF 😉 These are all items that I am confident you’ll love and a few splurge-worthy gifts in there as well that I feel are totally worth the wear they’ll bring! Which one is your favorite?? Santa, take note! I promise I’ve been really really good this year 😉 Also, with all of the kitchen appliances on here, it’s clear that I’m aging faster than the speed of light! Gold Eye Patches | My friend let me use these while traveling and DANG they are good. They lift, firm and reduce the appearance of bags and circles under the eyes. I’ve been wanting to treat myself to them, but thought they would also make a great gift! Highlighting Wand | This has been floating around Instagram and it definitely has been intrigued. One of the best makeup tricks I’ve learned in 2018 is how to highlight and I have to say that it makes a WORLD of difference. I hope to find this highlighter in my stocking. Everyday Dishes | We are in desperate need of new everyday dishes and I’ve actually had my eye on this set for a while. They are almost a direct dupe of THIS set from Anthro and you won’t believe the price of the ones that I want! Weighted Blanket | I sleep like a baby under a weighted blanket and it helps me to stay asleep on my back (aka how I sleep to prevent wrinkles lol). I think it’s time for my very own! The weight is calming and really does help your body relax. Also really good for people with anxiety. Logo Leather Tote | This is my big gift this Christmas and I couldn’t be more excited about it! MCM is trending as the new “IT” bag brand. Although not new at all, MCM offers their iconic logo leather in a variety of tried and true bags. I chose this tote because it’s the most functional bag for my current phase of life. It’s insanely well made and about half of the price of the similar sized Louis Tote. Want to know the best part??? IT’S REVERSIBLE! So essentially get two bags for the price of one! See all of their bags HERE. Cheeky Mug | I bought this for myself, because honestly it’s true. I do have a heart for people, but my mouth is about as sassy as they come. eeek. Gucci Belt | I want the white one and I’m not even ashamed to admit it. I’ve worn my brown Gucci belt more than any other accessory that I own that I feel like it’s been WELL worth the investment. Cozy Fleece Blanket | If this blanket is anything like the cardigan, I’ll have 10 of them please! Coziest material you’ll ever lay your paws on and I assure you that you’ll never want to leave your house. Initial Necklace | These May Brenner necklaces are trending big time right now and I love the dainty look, the classic feel and the personalized touch. Also a great push present. Colleen Rothschild Serum | Santa- I’m out of my favorite serum- please help! Silk Pillowcase | I’ve heard really great reviews about using a silk pillowcase to help prevent wrinkles, hair breakage and tangles. These are beautiful and functional. Journaling Bible | My goal for next year is to really take a personal journey through the Bible and I’d love to have this journaling Bible as a fun tool to work through. Ninja Coffee Bar | Hot coffee, coffee for one, iced coffee, frothed coffee– you name it, this machine can make it happen for you! For the $115 price tag, I think that every single mama should have it on her list. I personally own, love and use all of these things religiously. I am SO confident that you’d be thrilled to have them under your tree! Glam Eyeshadow Palette | The absolute prettiest shadow palette! The colors are so rich, warm and flattering and it’s perfect for the Winter months. Birkenstock Sandals | If you follow me on Instagram you know two things: 1. These sold out SO fast over the Summer and are finally back in stock! 2. I wore the HECK out of these sandals. Legit everyday. And go SO many compliments on them. GloPro Roller | Use this 2-3x a week and really do think that it helps to bring the life (and collagen) back to my skin. I got this last tear for Christmas. See my skincare routine HERE. Golden Goose Sneakers | Call me crazy, but I think that these are so functional, cool and make an amazing gift for the mama on the go! I wear them non-stop and really have gotten my wear out of them! Super Soft Jammies | I’m currently wearing one of the 7 pair of these pajamas that I own as I type this. Nothing beats them and I think that you should totally have them on your list! T3 Curling Iron | I use this daily and, overall, T3 curls better than any other brand, hands down. Sony DSLR Camera | I bought this last year and it’s really come in handy! It takes amazing photos and is really compact and lightweight. I’ve also bought the 50mm 1.8 lens to go on it and it takes amazing portraits. Michele Watch | I bought this as my gift to myself last year and I have worn it EVERY day since. It’s big enough to wear alone, but also stacks well. It’s amazing quality, absolutely beautiful and I’m 110%% happy that I bought it! I LOVE IT! Gold Hoop Earrings | My most worn earrings, hands down. Light as a feather, wear well, and go with ANY outfit. Kitchenaid Mixer | I use this bad boy WAY more than I anticipated and (even 10 years later), it’s still one of my most used kitchen gadgets. David Yurman Ring | Dan bought this for me a few years back in the smoky quartz and if you follow me on Instagram, you know just how much I wear it. People ask about it daily and I absolutely love wearing it. Gucci Sandals | I got these for my Birthday last year and have to say I’ve really enjoyed having them. I wore them a ton in the Summer and saved them for more dressy occasions where it was still appropriate to wear sandals….think date night, beach trips, girls night. I loved the elevated look of them, while not sacrificing comfort. They now come in a ton of colors, too! My Fav Perfume | This is the sexiest scent. YUM! I hope that this was helpful and that you find something you love! Don’t forget to forward it along 😉 Hope that you guys have a great week! I have the silver Yurman ring on your wishlist for this year and I LOVE it hope you and many of your readers are fortunate enough to receive it! I’d love any more of your David Yurman recommendations!